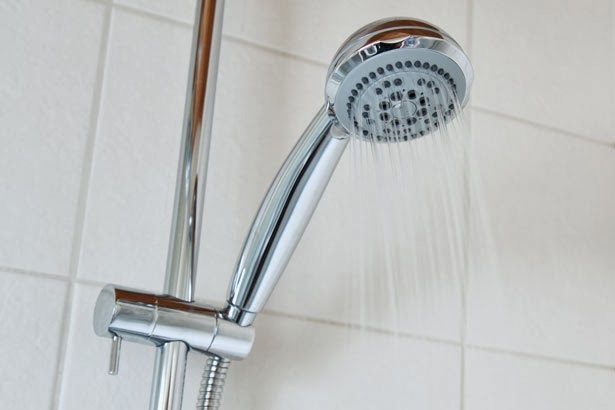 We've all already heard about the benefits of shorter showers and low-flow shower heads, so I won't bother with the why and how of those ideas. Especially since there are a few other 'think outside the box' ideas to trim effort and money from a hygienic necessity. A lot of women like to shave in the shower, and I am among that crowd. I don't have time for indulgent baths and trying to shave in a sink is messy and frustrating for me. So, the shower it is. But if I leave the water running while I am cutting those bad boys down, money and resources are just draining away. So, I do one of two things when I want to shave, depending on whether I'm using the shower that's in a bath or in a free-standing shower. If I'm in a bath, I simply put the plug in and shower while the water collects at my feet. When I'm done, there is plenty of warm water ready to use for shaving, so I turn off the shower and go at it. If I'm in a free-standing shower, I just bring in a plastic tub with me and lay it on the floor. As you shower, it catches enough warm water to shave with. So, just turn off the water when you are ready to shave and then back on again when you're done for a quick rinse. Although I often get screaming deals on shaving cream with coupons, even getting it free sometimes, the fact is we are on the cusp of graduating our fifth family member into the 'I now shave' club. Two males and three females lean heavily on our stockpile's supply of gel and foam, so having an inexpensive home made version at the ready is a great idea. Plus, I have two shavers with REALLY sensitive skin, and it's been both a struggle to find a product that works for them. . .that doesn't cost an arm and a leg! Use a mixer to whip it up. . .it looks like a block of soap right out of the fridge, but a mixer will soon whip it up into a cream, luxurious cream. Store in a container with a tight lid, in a dark cool place (bathroom drawer or cabinet works fine. When I was in my twenties, while waiting for a LONG time in a doctor's office for an appointment, I happened to read part of an interview with some young actress. I didn't know who she was, but what caught my attention was both her long hair (which was a similar length and texture to mine. . .mildly curly) and a line from the interview discussion how she kept control of her locks. She said that she always conditioned her hair FIRST and THEN shampooed. About 15-20 minutes before her shower, she would lightly dampen her hair and then apply her conditioner from about two inches below her scalp down through to the tips. She'd then cover her head in a shower cap (a plastic bag or wrap works well, too) to keep in the heat and help the conditioner penetrate the hair follicles. I was a little skeptical, but tried it and it makes a HUGE difference in my hair. Plus, I shave a few minutes off of my shower as I do the 'waiting for it to soak in' bit before I even turn the water on! Two of my kids are on the mildest edges of the autistic spectrum. Probably mostly unnoticeable to other people, their 'quirks' only come out at odd little moments. One of those, I discovered, was in the shower. Those two, at separate times, of course, read the back of the conditioner bottle for instructions. Both read that the conditioner needs to be left on 3-5 minutes before rinsing. Both only saw the '5.' As a result, both of them kept meticulously to that time frame, despite the fact that after applying the conditioner, they only had about a minute's worth of 'stuff' left to do in the shower. So, for four more minutes worth of water and electricity and propane, they just stood there. Waiting. When I discovered this, I tried to figure out a less wasteful approach. But, knowing they are both 'rule-followers' I knew I couldn't just say 'only leave the conditioner in until you're done washing your body.' That just WOULD NOT FLY. So I went with a 2-n-1 product for them both. It's a one application process and it works just as well on their young, healthy hair. Then I realized that there are two more males in our family who could also use it, and even the one daughter who has longish hair has discovered it works for her. Her hair isn't thick, so she is able to easily comb through her hair without regular conditioner. When she wants an extra conditioning boost, though, she just uses the 'conditioning ahead of showering' boost and her hair remains soft, smooth, and lovely. Out of the six of us, I am the only one who needs a separate conditioner to help keep my unruly mane under some sort of control. That saves us an average of over an hour's worth of shower water, heat and electricity over the course of a typical week. That's a significant enough amount of time, money and resources saved to make me pretty happy. Here's a bit of an odd one, but if you have mucky little pups, it actually can save a significant amount of water. . .and a little bit of money. I don't have any girly girls. Both of my daughters are feminine, of course, but they love to be outside and in the garden and working with animals. They aren't afraid to get their hands dirty. Or their clothes. And my boys are, well, BOYS! I despair over trying to keep their clothes unstained and un-ripped. They just chew clothes up and spit them out. Drives me (and my budget) NUTS. Add to all that, the soil here in our area of the Sierras is a heavy, orangish, clayish kind. It stains REALLY well. So, I constantly have to pre-soak clothes. My washer has a pre-soak option, complete with a pre-rinse and bonus agitation. But it costs money, uses lots of water, and, significantly, wastes time. I can't ever quickly complete a wash if I am always waiting for clothes to soak first. On days I'm not shaving, I will still choose to shower in the main bathroom, that also has a tub. I will still plug the tub to collect the water from my shower. But I will then add heavily soiled clothes (usually jeans) to the water. . .maybe add a little borax if I have a mind to. . .and let is soak away. Meanwhile, I can be running other, less soiled, loads in the time that I am soaking my gross stuff. I think the runoff shampoo and conditioner actually helps clean the clothes, too. . .
About 20 minutes before I will be ready for the clothes to go in the washer, I will unplug the drain and let the water seep out. I then give a quick squeeze to get any remaining water out and toss the items in a basket for transportation to the washer. Given I usually pre-soak at least four large loads per week, I estimate that I am saving at least 50 gallons of water. That's enough of a benefit in a drought to make the effort worth it by itself, but that I don't have to clog up the washing machine waiting for soaking clothes is of even greater value to me. Plus, the clothes come out cleaner and some money is saved. Here's another somewhat 'out there' idea that I have come to love. Try not to judge me. Typically, bathroom cleaning times happen in our home well away from either morning or evening showers. That means that by the time I get to it, all the moisture has evaporated and the grime is dried on. So I shifted the time I clean a shower to right after someone (usually me) steps on out of there. Why? Because it is SO much easier to remove grime and build up when moist, steamy air and even the remnants of shampoo have softened it all up. Seriously. Like 1/4 of the effort and time. And I hardly have to apply my home made vinegar cleaner, either. . .the steam has done most of the hard work for me. I usually quickly squeegee the excess water, spray my cleaner, wipe and I'm done. No elbow grease, heavy cleaners or scrub brushes needed. So... inquiring minds want to know: does your vinegar cleaning stuff work on the oil residue from natural, homemade toiletry products made with oils...? Why yes, it can, depending on the exact stuff. Vinegar is acidic and works well against alkaline muck like oil, soap scum, and hard water (mineral) deposits. Wipe as much as you can away (after a steamy shower!) and apply either full strength white vinegar or a strong solution of it (at least 3 parts vinegar to 1 part water). If it's MEGA mucky, soak a paper towel and press gently onto the offending area. Leave for at least an hour or two (or overnight!). I do this on tricky areas, like on facets. If the build up is very thick, you might have to reapply, but eventually, it will cut through it all.